Available in white, this freestanding washing machine will suit any kitchen or garage. 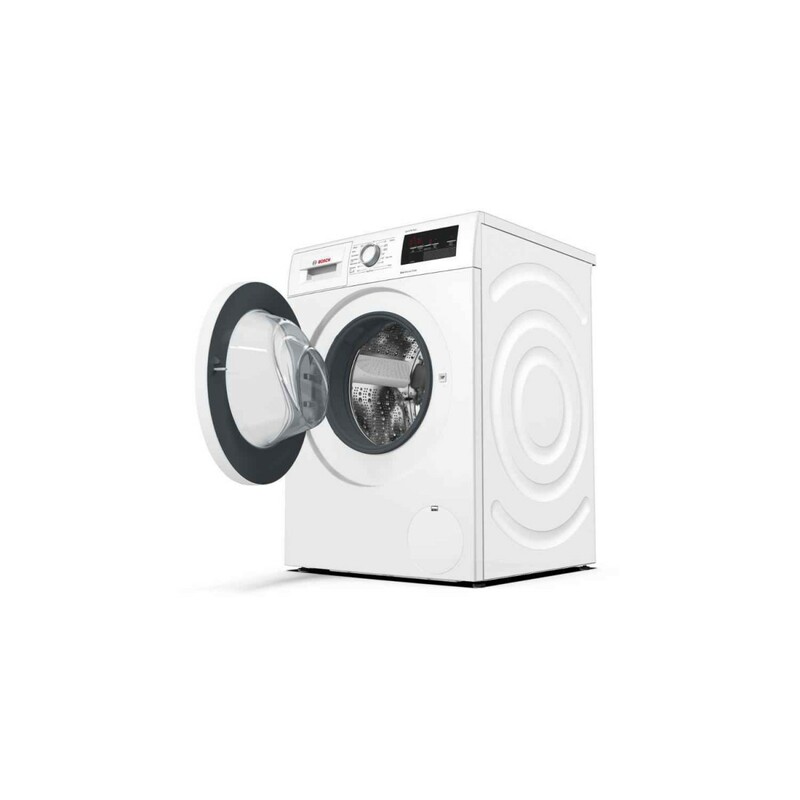 With a 9 kg capacity, the WAT28371GB can clean large loads in each cycle, making it an ideal choice for families. Awarded an A+++ -30% rating for energy efficiency, this model could save you more on running costs than A-rated washing machines. 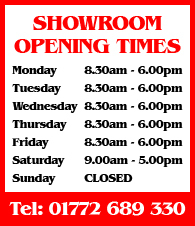 Programmes A choice of 15 programmes gives you multiple options for washing your clothes and fabrics. If you lead a busy family life, the Mixed Load and Super Quick cycles are perfect for when you need to wash clothes in a hurry. 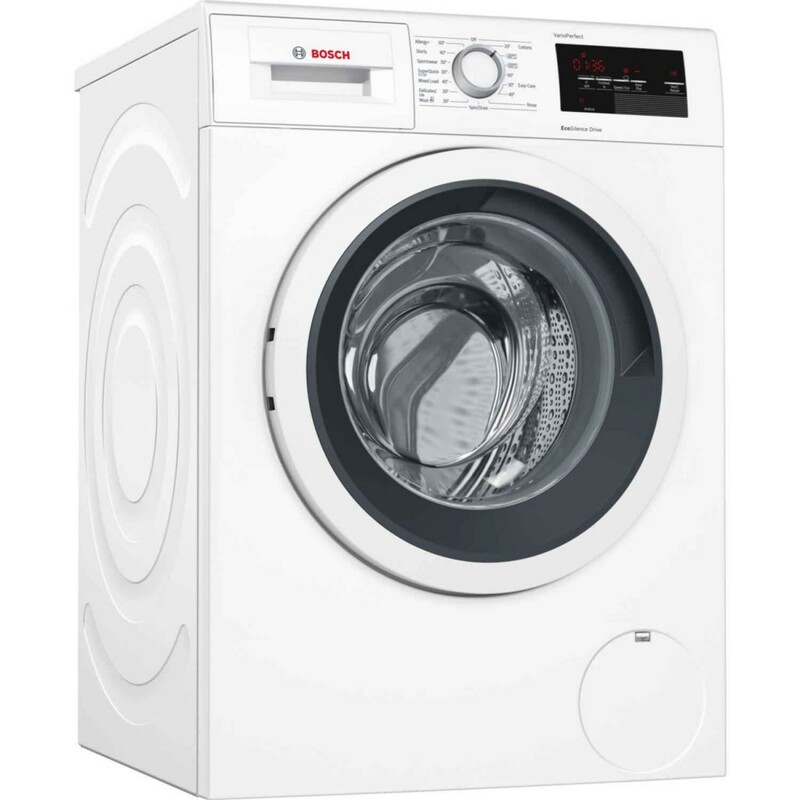 Other programmes include: Cottons 20/30/40/60/90 Cottons 40 Eco/60 Eco Easy Care 30/40 Delicates/Silk Wool Mixed Load Super Quick 15/30 Sportswear Rinse Spin & Drain Find the right settings for everything you wash with the WAT28371GB. Features In addition to its great range of programmes, the WAT28371GB has a number of smart features to improve performance. 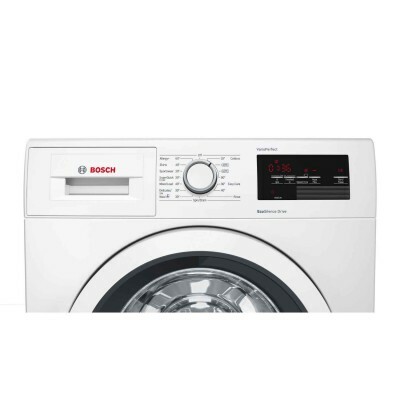 Using Bosch’s Eco Silence Drive, this washing machine houses a brushless motor. The result is a unit which is quieter, faster, more energy efficient, durable and powerful – all at the same time. It also comes with a ten year warranty for your peace of mind. Bosch’s VarioPerfect function even gives you different options for each cycle: choose between EcoPerfect to save energy or SpeedPerfect to save time. EcoPerfect can save up to 66% of the energy used for a cycle, while SpeedPerfect ensures that your load is cleaned in under an hour. Both options will clean a full load with no compromise on results. 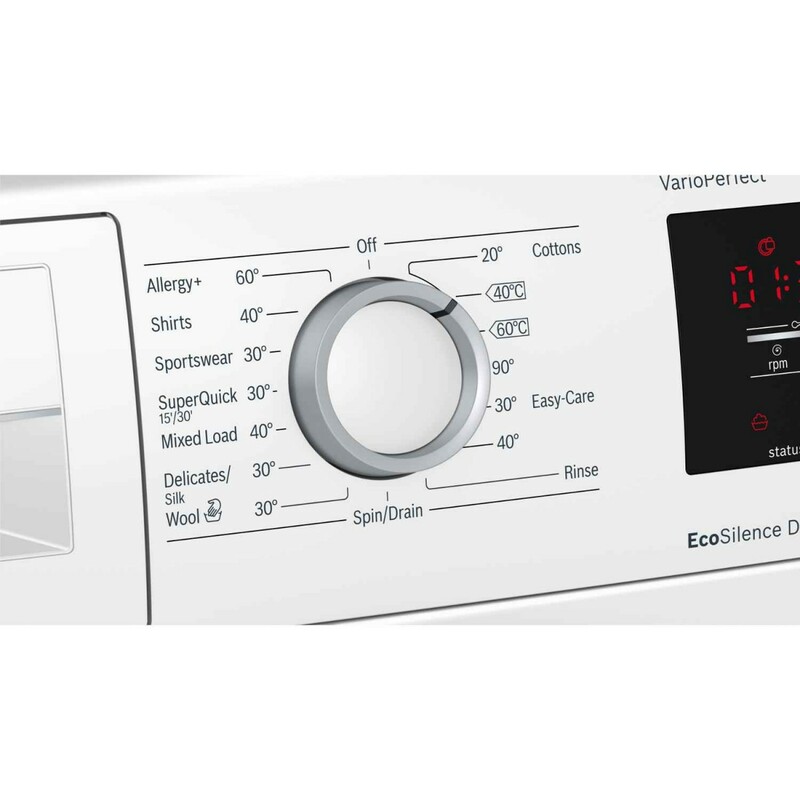 This washing machine also features the 3D AquaSpa Wash System. A wash and shower system, water enters the drum from three sides for a quick and even soak. During the cycle, paddles within the drum scoop and move water for gentle washing. Get the best possible water usage from the WAT28371GB. Extras Some helpful extras make the WAT28371GB even easier to use. 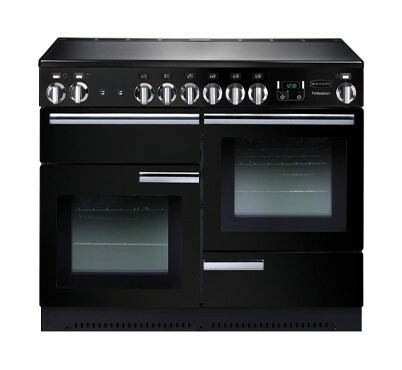 The front of the unit displays a large LED panel, where you can check times and settings at a glance. There is also a child lock to make sure your little ones don’t change your machine’s settings. For added convenience, this Bosch machine even features a self-cleaning detergent drawer. With smooth sides and jet sprays in each corner, the WAT28371GB will automatically flush the detergent chambers, preventing any build-up.